Almost all of the 60 fraternities and sororities inspected in 2012 had violations, many of which included disconnected smoke detectors, overloaded extension cords, broken sprinklers and faulty emergency lights, according to 2012 inspection records. Other violations were for unapproved cooking equipment such as hotplates, pizza ovens and self-heating skillets. Fraternity and sorority officials emphasize fire safety and have programs to increase awareness of the dangers from not meeting code requirements. But they also acknowledge it is difficult to prevent and correct violations because of the youth of students and budgets. “We don’t tell them to go fix their house or anything like that, but we provide as much material as we can on safety, which includes stuff like sample safety checklists, sample fire inspection lists and that kind of thing,” said Kevin Madden, national director of member safety for the Delta Chi fraternity. Furthermore, city inspectors said all Greek houses certified with the university program are given inspection schedules at the beginning of the semester. That means violations occur even though house managers are notified in advance of inspections. They also acknowledge that some violations go months without being fixed. Sometimes corrections are made, but not immediately documented by the inspectors. In other cases, house managers make corrections, but do not tell inspectors right away. “By the time we check up on it again, usually it’s been done and they failed to communicate with us and say, ‘We’ve done that,’” said Michael Lambert, a Champaign housing inspector. The University of Illinois has the largest number of Greek chapters in the country, according to the University’s website. Greek fraternity and sorority houses at the University hold about 4,000 students in total when full, said Mari Anne Brocker Curry, associate director of housing at the University. Another 4,000 or so students belong to chapters but do not live in the houses. Most of the fraternity and sorority houses are certified for meeting fire safety codes through yearly inspections by Champaign and Urbana inspectors. Another 15 private student housing facilities – that are not Greek houses – are also certified and inspected. Last year, inspectors examined 35 fraternities in Champaign and six fraternities in Urbana. They inspected eight sororities in Champaign and 11 sororities in Urbana during the same time period. Officials from the Fraternity and Sorority Affairs Office at the University said the number of certified fraternities and sororities changes from year to year. While there were a total of 60 certified Greek houses last year, there are 62 this year. The increase was because of two additional sororities that became certified. This year’s inspections are currently underway. In total, there are 97 Greek chapters listed at the University. Some do not seek certification and some do not have residential housing. Some violations took more than three months to correct, which was the case with the Alpha Tau Omega house. Last year, inspectors found 68 violations in September, 26 violations in October and 23 violations in November. By the fourth inspection in March of this year, inspectors found zero violations. Jack Polancich, the house manager for Alpha Tau Omega, said the fraternity’s new executive board that is made up of current Alpha Tau Omega brothers addressed the violation problems last summer. “The new executive board met with the alumni board of trustees over the summer, and the alumni suggested Alpha Management,” Polancich said. In other cases, inspectors have found that violations actually increase from one inspection to the next. Inspectors cited Tau Kappa Epsilon for 21 violations in August of last year during a “pre-inspection,” and then for 38 during the house’s official inspection a month later. Inspectors said they conduct pre-inspections when there are violations left over from a previous year’s inspection rounds, or if a house had major remodeling or updating. Inspectors said that the University’s “party culture” and the fact that so many students are living alone for the first time make the high number of violations expected. “People now will go out and party and come back to the house and – because they are under the influence – they will kick doors, punch holes in walls and destroy exit signs,” Lambert said. From 2007 to 2011, U.S. fire departments responded to an average of almost 4,000 fires a year in dormitories, fraternities, sororities and barracks, according to the National Fire Protection Association. Those fires caused an annual average of two civilian deaths, 30 civilian fire injuries and $9.4 million in property damage. A single fire can result in multiple deaths. In 1996, five students were killed and three were injured the day before graduation at the University of North Carolina Chapel Hill’s Phi Gamma Delta house. Investigators blamed a cigarette tossed in a trashcan, according to the National Fire Protection Association. “We’re still responsible for these people’s safety, though we don’t own a specific house,” said Madden. Nonetheless, during a September 2012 inspection, Delta Chi had 44 violations. It had six violations during its re-inspection in October. Inspectors mark that a violation has been corrected in their own personal notes, and then include that information when approving properties after their first re-inspection. Sometimes inspectors do not follow up by the date required for re-inspection, Lambert said. So, the violations may be corrected, but inspectors have not revisited the house to confirm. Other violations are fixed in front of the inspectors on site, such as objects that are moved away from an obstructed fire exit. Champaign has a total of four inspectors. Two were specifically assigned Champaign’s 43 Greek houses in 2012 in addition to their other duties. They also covered 10 of the non-Greek privately owned apartment buildings last year that were certified as safe and healthy by the University of Illinois. Urbana has two inspectors. In 2012, those two covered the city’s 17 Greek houses and its five safety-certified apartment buildings in addition to their many other inspection duties. Urbana approved funding for a third inspector in October. After a house fails an initial inspection, inspectors schedule a re-inspection for 30 days later. Inspectors monitor some residence halls, tooBy Janelle O’Dea and Robert HollyIn addition to fraternities and sororities, inspectors visit 15 privately-owned residences that fall under the certified housing rules, such as Bromley Hall, Illini Tower and Newman Hall. “Ultimately, it’s about safety, so it’s good to have an outside set of eyes to check out for things and find things that maybe our staff has missed,” said Tristian Pisarczyk, the director of operations for Newman Hall in Champaign. These non-Greek properties certified by the University hold about 2,900 students when they are full. The privately-owned housing is, like the Greek houses, certified by the University and by the cities of Urbana and Champaign. It, too, must pass yearly safety inspections to get and keep the certification. Yet, inspectors find violations at these properties, as well. Non-Greek certified properties had more than 420 violations during initial inspections in 2012, according to inspection documents. – 140 violations at Bromley Hall during September inspections, including “combustible decorations” and “cracked and soft” bathroom ceilings. Bromley Hall houses more than 700 students, according to its website. – 131 violations at Illini Tower during September inspections, including 13 carbon-monoxide detectors that were missing or had dead batteries, and smoke detectors on multiple floors that were more than 10 years old. Illini Tower houses more than 700 students, according to its website. – 85 violations at Newman Hall during October inspections, including power strips connected to other power strips and obstructed electrical panels. Jennifer LaMontagne, director of marketing and communications for the hall, said that Newman Hall houses 586 students. – 20 violations at Presby Hall during October inspections, including fire extinguishers that needed servicing and inoperable or missing emergency lighting. Presby Hall houses 262 students, according to Presby staff. Pisarczyk said the Newman Hall staff takes different measures to address fire-safety standards throughout the year. Staff members at Newman Hall also organize regular emergency drills to keep residents prepared, Pisarczyk said. While many violations are for minor things such as leaving flexible cords under closet doors, Michael Robinson – the vice president of marketing for Campus Living Villages, the company in charge of Illini Tower – said Illini Tower staff takes all violations seriously. However, some violations require extensions and more time to fix. For instance, an electrical wiring hazard or hole in a ceiling may not be fixable in a 30-day window, inspectors said. Furthermore, Greek houses sometimes have trouble coordinating who pays for the repair costs of substantial violations. Monica Scinto, vice president of housing for the Pi Beta Phi sorority, said budgetary constraints slow the process and cause delays in fixing violations. She said that while Pi Beta Phi would like to make improvements and fix violations as soon as possible, it has to follow spending orders from David Kelton, the owner of Greek Management. Greek Management is a property management company hired by the Pi Beta Phi alumni board to oversee the house’s property maintenance issues. Kelton said it is not Greek Management but rather the corporations that own the Greek houses who make the decisions on what is fixed first and how a house’s money is spent. “Life safety is number one on the list, and then it’s up to the corporations to decide what they want to do,” Kelton said. If violations continue for too long, houses are eventually de-certified by the Office of the Vice Chancellor for Student Affairs. Vice Chancellor of Student Affairs Renee Romano said she tries not to take away certification too quickly, though. She said she could not name one house that lost certification in the eight years she has held her post. 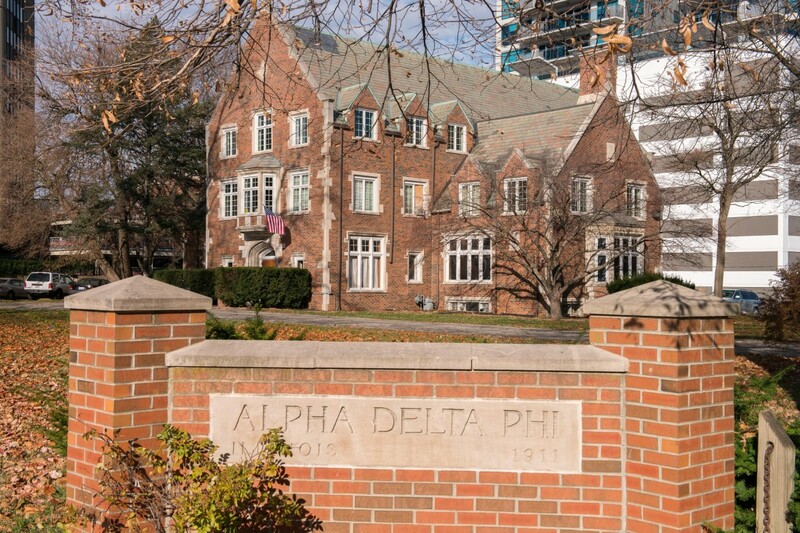 In a September 2012 letter, inspectors required the installation of a locking door to Alpha Delta Phi’s crawlspace because they found beer cans and tea lights in the space, a clear fire-safety violation. Inspectors found 34 violations when they inspected Acacia’s new house last year in September 2012. When they went back for a re-inspection in early October, 19 remaining violations included self-closing doors that did not shut, daisy-chained power strips, sprinkler obstructions, plumbing out of order, holes in the ceiling and blocked exits. The Acacia fraternity acquired the new house in April of 2012. Previously, the house belonged to an all-female sorority. National representatives from Acacia said that some of these violations were because of the remodeling and construction involved with transitioning an all-female house into an all-male house. Inspectors found zero violations during a third inspection later in October 2012. Recently, the University’s housing office made organizational changes to better deal with housing violations. She said that the university must try different organizational approaches to address violation problems with new sets of students each year.